The world Union of viola players! Vadim Vasilievich favoured me with his friendship and kind attitude to my music and to me for a long time. It has always been a great joy for me to associate with him as a musician of a tremendous talent and great skill and also a person of a big heart and a great culture and erudition. If asked what exactly attracts me most in Borisovsky' personality I would answer: Everything. The twentieth century and especially its first half was a promising time for the art of viola playing. It was then that some bright musicians brought the instrument into prominence and made it a concert instrument. In Russia this transformation was particularly connected with Vadim Vasilievich Borisovsky (1900 - 1972) . Borisovsky began his studies at the Conservatoire as a violinist but later took a great interest in viola. He became the only graduate who specialized in playing viola in the class of Vladimir Bakaleinikov. Even when a student he began working in different orchestras in Moscow. Later he became the leader of viola players at the orchestra of the Bolshoi Theater. The first solo performance by Borisovsky took place in the Maly Concert Hall of the Moscow Conservatoire in 1922. It was the beginning of a long and very successful concert activity. Many venerable musicians of the older generation recognized brilliant performing qualities of a young viola player such as impeccable sense of style, subtle artistry and powerful very rich truly majestic sound. 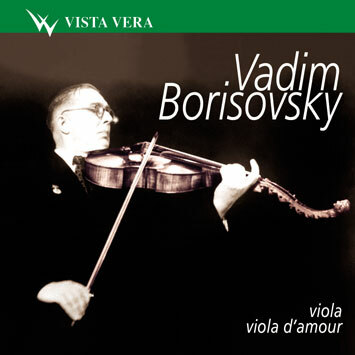 Apart from viola Borisovsky attached much attention to viola d'amour. He learned to play this instrument on his own in 1926. Already in 1927 he made public performances in Moscow and Leningrad playing both original compositions and transcriptions. Vadim Borisovsky teached at the Moscow Conservatoire for almost half a century. He trained there a galaxy of musicians. His pupils and now the pupils of his pupils work in leading orchestras and conservatoires of the country. Composers like Vasilenko, Kryukova, Vainberg, Khachaturyan, Shostakovich, Denisov, Shnitke, Kancheli, Schedrin dedicated to either Borisovsky or his pupils the best works for viola written in the XXth century. Borisovsky's transcriptions of classical music, there are more than 200 of them, are performed all over the world. For over 40 years Borisovsky worked with the Beethoven State Quartet and it's a very important part of his musical career. Borisovsky and his colleagues were both outstanding soloists and excellent ensemble musicians and that resulted in the highest artistic standards of the quartet. It's a unique case in the history of music that Dmitry Shostakovich dedicated one string quartet to each of the musicians of the ensemble. His famous No 13 is dedicated to Vadim Borisovsky. М.Glinka (1804-1857). Sonata for viola and piano (unfinished), in d minor. Recorded: 1950 (6-9); 1951 (1-5; 10); live from the Small Hall of the Moscow Conservatoire12.01.1956 (11-12).